Get More Bang From Your Blog: Optimize Posts! If you are a small business owner or are trying to build your brand or professional reputation via the web, chances are you are already blogging. Hopefully you’re using your blog to share your expertise, offer advice and industry insights – offering your readers something of value and not just self-promoting. Your blog can open up tremendous opportunities for you. Readers may have questions about your products or make inquiries about guest posting on your blog. Press and media contacts often look to bloggers to provide “expert” quotes, opinion or commentary for articles they’re writing, or may even ask you to contribute an article for their site, allowing you to expose your brand to new audiences. Like your website, it helps if your blog is well optimized for search engines. After all, readers discover your blog by searching for keyword phrases on Google, Bing or Yahoo. SEO for blogs is easy and you can build into your blogging routine or publishing process, especially if you use a search-friendly platform like WordPress (which we’ll discuss in more detail later). As with the SEO you do for your website, you need to do some keyword research first. We touched on some of the basics of keyword research in an earlier post, which described how to get started without the use of tools. If you’re ready to step up your game, you can take advantage of Google’s free Keywod Planner. Use it to enter some phrases you think your audience will be searching for, and AdWords will return a list of phrases that match the terms you’ve listed. AdWords may suggest phrases you hadn’t thought of before; the tool will also show you how many searches are conducted each month — and how much competition there is — for each keyword phrase. Select keywords that have a high search volume, but aren’t too highly competitive, and try to use the keywords you’ve selected in your post’s title or headline. Beyond that, just make sure you are delivering quality content. Remember the basics – write clearly, use simple language, and make sure you proofread and spell check your work. Your blog is the face of your business, so make sure you present yourself well. If you are running a self-hosted WordPress blog then you’re already ahead of the game! WordPress posts are already search engine friendly, and there are popular plugins that can help make optimizing your blog post easier. Our personal favorite is SEO for WordPress by Yoast. 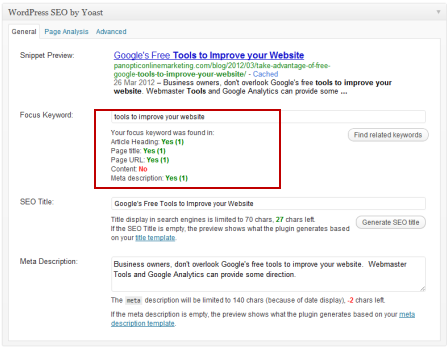 Yoast’s SEO plugin has a feature that lets you see a preview your post as it will appear in search engine results, so you can tweak your title and description until you get the desired results. 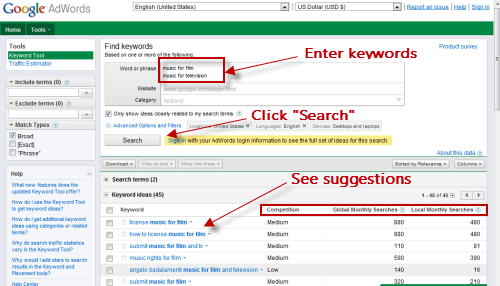 There’s also built-in keyword suggestion tool and a cool little guide to show you where your focus keyword is appearing. There are also some advanced features, including the ability to integrate your Facebook Insights, customize your RSS feed, generate XML sitemaps, and a whole host of other options you can either learn how to use to book your rankings, or ignore completely. It’s fine to start small and focus on the things that really count: the title or headline of your post, and the quality of the content. Get those things right and the rest can be implemented as you get familiar with the tools and best practices of optimizing your blog posts. Confused About Optimizing Blog Posts? Relax and Stick with the Basics.